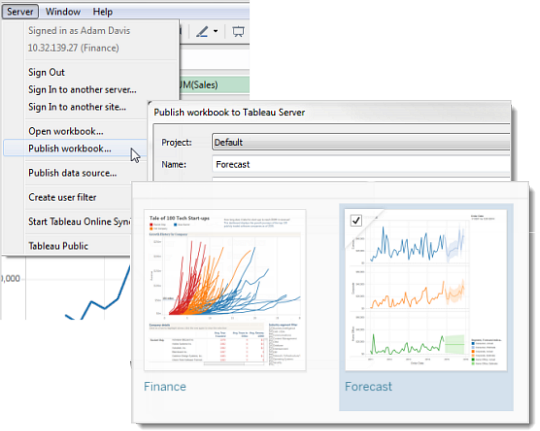 When you publish a workbook or data source, a version is saved in the revision history for Tableau Server and Tableau Online. You can revert to a previous version at any time. 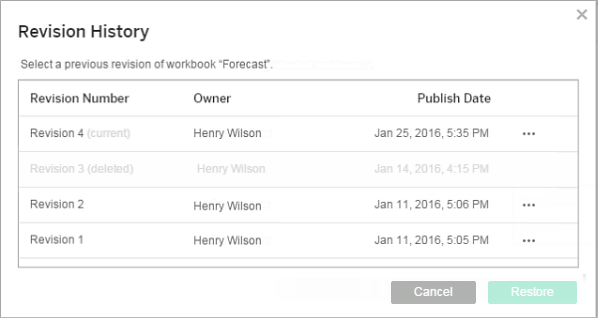 You can also save workbook revisions by editing and saving a workbook in the web-authoring interface of Tableau Server and Tableau Online. Click the actions menu (. . .) for a workbook or data source, then click Revision History. The following image shows a workbook's revision history. From a revision’s actions menu (. . .), click Preview. If a preview is available, it opens in a new tab in the browser. For workbooks that you can't preview on the server, such as those with OAuth data connections, you can download the revision and open it in Tableau Desktop. From a revision’s actions menu (. . .), click Download. Open the downloaded file in Tableau Desktop. In the revision history, select a revision, and then click Restore. The restored version becomes the current version. Note: If a revision can't be restored directly on the server, download the revision, open it in Tableau Desktop, and republish it. If a workbook uses a live data connection that prompts for a user name and password, you have the option to embed credentials for the connection. If the workbook uses a data source with multiple connections, you might need to provide credentials for each one. If a workbook uses data extracts with scheduled refreshes and embedded credentials, you’ll need to edit the data connection to provide the credentials. For a variety of reasons—for example, extracts commonly are on refresh schedules—a previous revision of a data source will not include the extract as it was published at the time. To restore the extract, you can download the previous revision of the data source (in .tdsx format), open it in Tableau Desktop, and re-publish the extract. For more information, see Data changes and deletions under Potential revision history issues. Sign in to the Tableau Server or Tableau Online web editing environment, navigate to the data source, and open its revision history. From a revision’s actions menu (. . .), click Download . 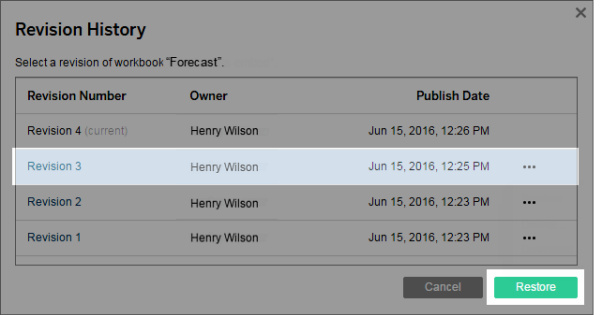 Open the downloaded file in Tableau Desktop, and then republish it with the same name, to the same location on your Tableau Server or Tableau Online site (confirming that you want to overwrite the existing version). The uploaded version becomes the most current version. From a revision’s actions menu (. . .), click Delete. The revision history list updates to indicate a revision has been deleted. If a different author publishes over a workbook or data source with the same name, the most recent author becomes the owner of the content and can see its entire revision history. Workbooks and data sources are downloaded with the latest configuration of their extract or data connection. If the data model or data connection has changed between revisions, you might need to update the downloaded workbook or data source. Revisions of workbooks and data sources that use .xls or .csv files are saved with an extract of that data. Revisions are saved for extract files, unless they’re on a refresh schedule. If a workbook or data source is deleted from a site, all revisions are also deleted. 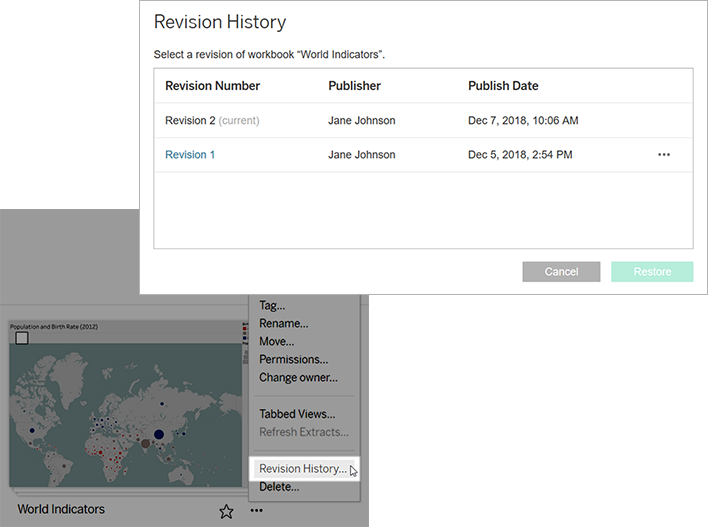 On Tableau Server, server administrators can disable revision history for specific sites. If revision history is turned on and then off, saved revisions are retained, and new versions overwrite the latest version. If revision history is then turned on again, version numbering starts from the last saved revision. If you’re a Tableau Server administrator, see Enable Users to Save Revision History for more about revision history settings.